Marketing legal, adult use cannabis in Canada is tricky but one Licensed Producer has found a fun approach to talking about cannabis this Valentine’s Day. 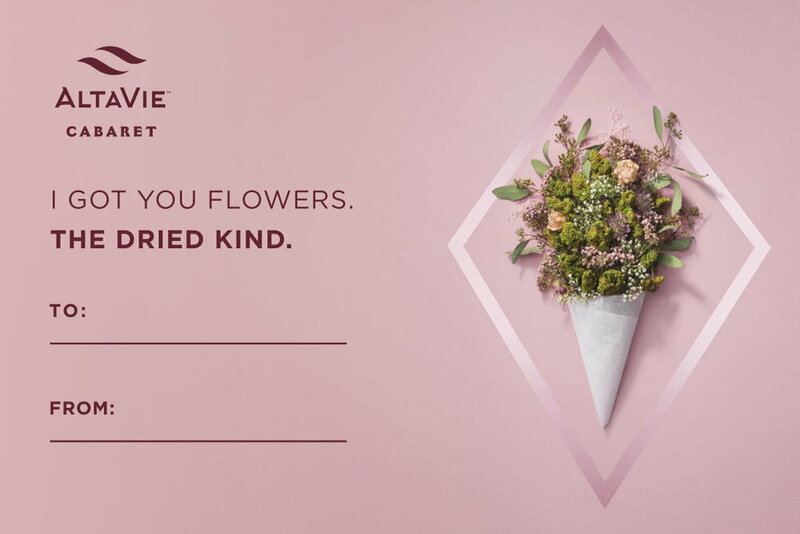 Aurora, the LP behind AltaVie wants customers to find new meaning in giving flowers to those they love this year: “Send Flowers. The Dried Kind.” Recommended pairings: a romantic dinner, a sensual massage and a ‘Do Not Disturb’ door hanger (which you can pick up in-store). Select retailers across Alberta will share in-store promotions – including a branded poster, strain profile card, ‘Do Not Disturb’ door hang and Valentine’s Day cards. If you live in Alberta and are of legal consumption age, consider celebrating V-Day with your loved ones by checking out the campaign and spreading the love with dried flower this year. After all, what does chocolate, lingerie, jewelry, and cannabis all have in common – they are great Valentine’s Day gifts.